The Tibetan monks spent nearly two weeks creating the four-foot-wide Mandala out of tiny grains of colored sand, but it took them only a few minutes to destroy it. The Mandalas are amazingly detailed, nuanced, and delicate. To show you more of what a Mandala looks like, here is the Mandala the monks made in 2006, in the last stages of completion. 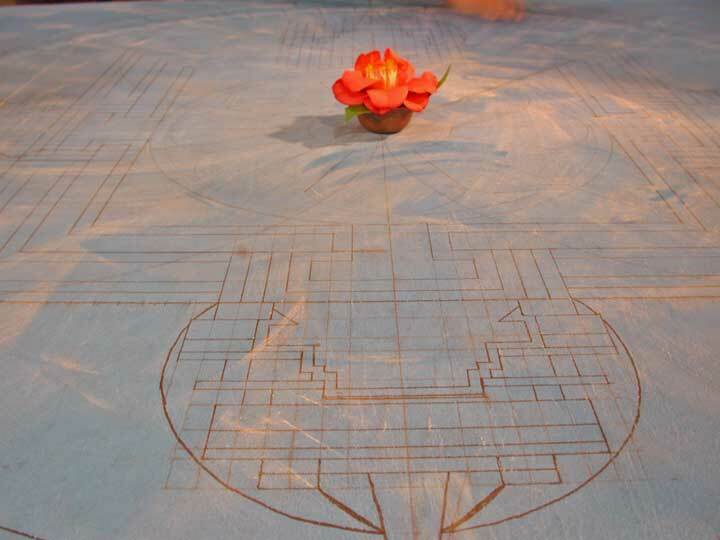 In January 2007, Tibetan monks in exile, now located at the Drepung Gomang Monastery, in South India, worked every day for nearly two weeks to construct the Mandala shown below. The Mandala was created in the lobby of the Mary Brogan Museum of Art and Science, in Tallahassee, Florida. It is colored sand. Millions of tiny grains of colored sand and finely-ground stone, painstakingly poured in intricate lines — little lines that have ridges of depth, like tiny ropes or woven fabrics. The result evokes a universe of sea and sky, Himalayan mountain ranges, tilled fields, villages and vast cities, eras of time, spiritual beings, states of the soul, kinds of relationships, schools of thought, phases of life — the whole of anything anyone can conceive of, or be part of. Every part of the Mandala exists in an intricate interplay with the others. Wherever you focus, the periphery of your vision changes to see the remainder differently. The Mandala does not just lie there. As you look at it, it moves. It seems almost alive. This particular Mandala is also said to evoke the presence of Avalokiteshvara, the Bodhisattva of compassion. You could hear echoes of the fundamental teachings of Buddhism in the Mandala and the ceremony that surrounded it. Anicca, anatta: Everything is so deeply interconnected that everything causes everything else. And everything changes, moving as a vast flow of trillions of processes: There is no permanence, no lasting city, no separate and enduring thing — not even a separate and enduring self. Dukkha: To believe otherwise is the main way human beings amplify suffering into a kind of vocation. And something more: Knowing, really knowing these truths can lead to a sense of liberation that embraces joy and sorrow, life and death, daily routine and spiritual depth — and that connects us compassionately with all beings in this web of existence that creates us as we create it. And it is said to be possible then to see that the whole vast intricate enterprise of the universe is not meaningless matter but a great sacred whole, a Mandala, of which we are a part, in which all beings are ultimately destined, no matter their struggles to the contrary, to become enlightened. And it is said that the very cycles of entanglement and suffering that earn this world the label samsara are, to the enlightened mind, enlightment itself. But no one preached, no one proselytized. The ceremony was left to speak for itself. Through the translator, the Geshe explained the purpose of their visit: To remind people about the plight of the Tibetans. To raise funds for their monastary in India. To pray for every sentient being, especially for those killed in Iraq. To remind us of the impermanence of all things, and how important it is to use the time available to us to help others and develop spiritually. And through the Mandala to bring a blessing to Tallahassee and to the universe. Solemnly began the ceremony of dismantling the Mandala. The two fierce oboe-like shawms pierced the museum, rattling deep into your bones. The sound of the cymbal rose and broke, rose and broke, like waves of mountains crashing into a continent over geological time. The monks were practiced, efficient, yet tender. Taking the dorje, the sacred thunderbolt, the Geshe began the dissolution of the Mandala. He cut swift strokes in toward the center, a gesture that causes an almost physical pain to watch. And more cuts. The movements were authoritative, sudden, and inevitable. Until the circle was divided into eight parts. With quick, graceful strength, the monks swept the intricate grains of the Mandala toward the center. The rest happened in the time of a few startled breaths. Scooping up the pile of formless grains into a glass vessel. And scooping . . . But a small pile of sand, like ashes. Reverently, the monks wrapped the dismantled Mandala. . .
Leaving the empty backboard, with the faint outline the Mandala was built on. And a single camellia, with a scattering of dust, at the center. Drepung Gomang articles on the Mandala shown above. Annotated illustration. Paul LeValley’s essay on the Mandala. Buddhist Groups in Tallahassee, Florida. “Buddhism: A Brief Introduction for Westerners,” by Gerald Grow. Mind-Clearing Exercise: A basic meditation adapted for Westerners. A note on the photos.